Chocolate Baroque are back on Hochanda TV today (2pm) and tomorrow (8am) bringing lovely sewing themed stamps and other creative goodies (Freeview Channel 85 or watch online via their website). Here is one that I created with the Haberdashery stamp set x.
Emboss the teal card and sand it back to highlight the texture. Trim and glue to the card front. Overstamp the die cut trellis randomly using the button stamps with purple and turquoise inkpads. Glue to the card front. 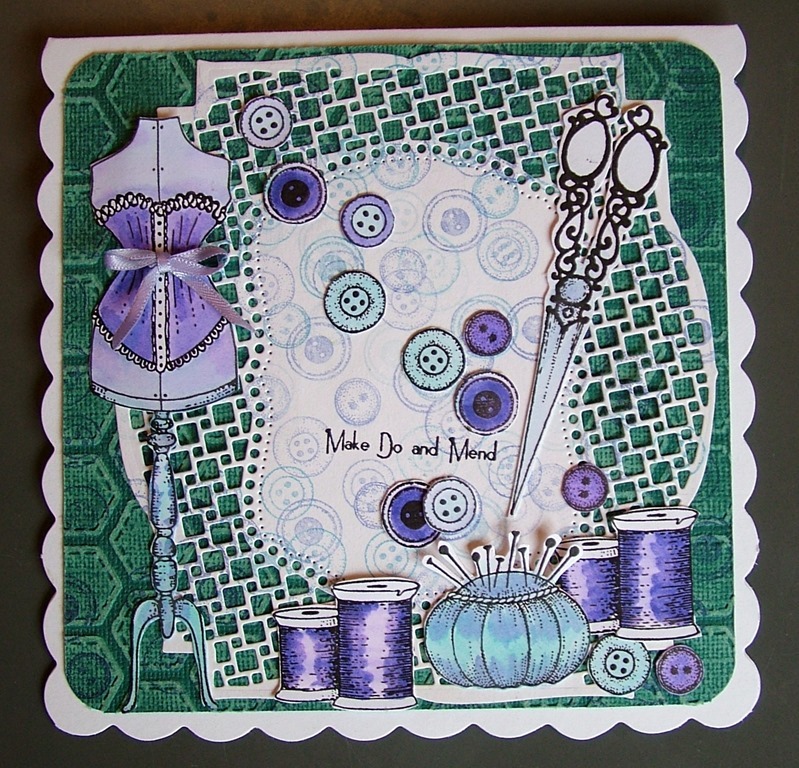 Stamp the haberdashery elements with Versafine. Cut out and colour with watercolour pens. Glue to the card front. Finish with a small bow. This entry was posted in Card Making, Chocolate Baroque, Hochanda, Paper Crafting, Stamping and tagged Anne Waller, Card Making, Chococlate Baroque, Haberdashery, Heatherwell Designs, Stamping by annewaller. Bookmark the permalink.